This is a post I never imagined I'd have to write. Some of you may have already seen my update on Instagram yesterday. For the rest of you, here it is. 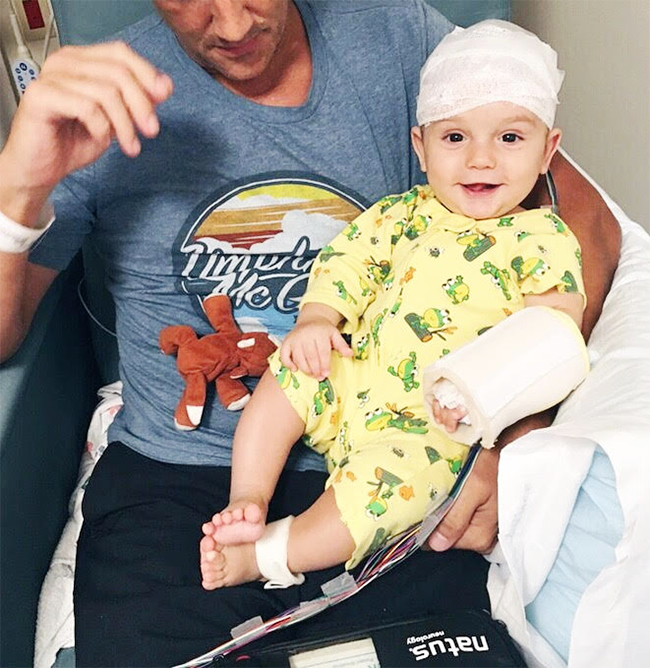 On Tuesday morning of this week, Emmett's 7 month birthday, he was diagnosed with a rare, serious form of Epilepsy. The only symptom was an occasional random head nod he'd had on and off for a few days that we decided to have checked out by his pediatrician, just to be safe. Long story short, after an immediate trip to a pediatric neurologist and an EEG, we were given a diagnosis, and spent the rest of the week in the pediatric unit of Northwestern/CDH hospital. The prognosis for this specific type of epilepsy is very poor for the vast majority of the cases - but most of the tests we've had done, along with the facts that Emmett is developmentally where he should be for his age and we caught it very early, are positive signs. They have also found no cause for this with Emmett (which is actually a good thing with this specific disease). His time in utero and life up to this point have been perfectly healthy. We are now giving him twice daily injections at home of a powerful medicine that, while not without extreme side effects, will hopefully help end his seizures soon and thus give him a chance. How he reacts to the medication over the next couple of days is crucial in determining what the outcome will be. Whatever your beliefs, please channel good energy, pray, manifest, meditate, focus on healing vibes for our little boy. I believe in the power of positive collective energy - I have seen it work. The more people sending love and light his way, the more people praying, and the more people envisioning a positive outcome, the better I believe his chances are. We are so grateful for the support and love of our friends (internet friends included) and family right now. We feel lucky to know so many kind, compassionate people who care about our family and our son. I am terrified. This is hell. But I believe. Just like I had a strong maternal instinct that told me something was wrong when it looked like absolutely nothing, I have a strong instinct telling me that Emmett is going to pull through this and be one of the exceptions. For right now, Bubby and Bean will remain silent of regular posts while we make sense of this. My number one priority right now is to focus on Emmett and his sister. I also ask you to forgive me for not being the best communicator right now, and not in the head space to answer questions or to be able to handle much more than just good vibes. I will update as I can. Thank you in advance for sending any love you can our way. Emmett is a fighter, and I believe in him with all my heart. Oh my gosh, I am so sorry your family is going through this. I cannot even imagine. I will be praying. He is a beautiful little boy. Praying for your strong boy and your beautiful family!!!! Look at his precious smile!! You and your lovely family are in my thoughts. Sending prayers and good thoughts your way. I grew up having seizures and being on medication. It eventually subsided. I pray the same for Emmett. I also have children and know how much stress an illness can cause a family. Stay positive and strong and know that others are praying for you. Bubby & Bean is my favorite blog and my favorite posts are those where you share your beautiful family. My heart breaks for you but I believe too. I have a strong feeling brace Emmett is going to make it through this with flying colors. So much love your way. Jesus is the only healer period... My nephew was healed of this very thing by none other than Jesus! Jesus heal this little boy now, no more sickness, no more pain, the only positive thing that can heal him is the fact that when you died, by your stripes we were healed. You died so Emmett could receive his healing! Give this family a testimony of what only you can do! In Your name I pray! Channeling the highest vibrations of universal healing. Holding Emmett in my heart. He's going to get through this. Sending all of my love your way and focusing on a full healing for your beautiful boy. I just know he will be ok! I am so sorry your family is going through this, I cannot even imagine. You are all so strong. All my love and all the light in the universe headed your way. Let me know if there's anything I can do from here. I am sending all my positive thoughts your way. Catching things early can make all the difference. You guys are great parents for bringing him to the doctor when you did. Sending every ounce of positive energy I have your way!!!! Sending never ending light and live in your direction. I can only imagine what a difficult time you are having. Please take care of yourself too; a massage or pedicure if you can get away, anything to give yourself a break. I meant to type love not live. Love love love. Oh, Melissa, I am so sorry to read about this news. I am sending lots of positive energy to Emmett and your family. Sending healing thoughts and deeep wishes for peace, love, and strength to Emmett and to the whole family. Praying for your little guy and your family.